Home > upward income redistribution	> The average American household is becoming increasingly worse off. The average American household is becoming increasingly worse off. 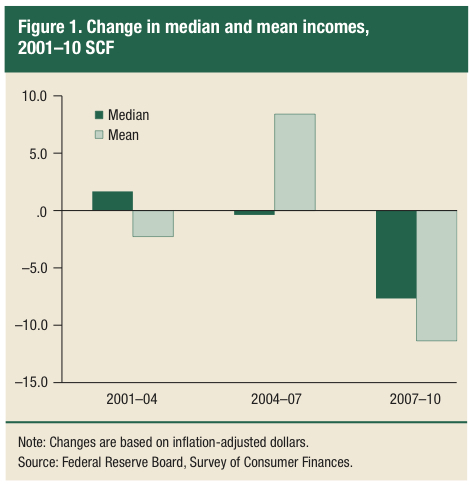 According to the Fed’s latest Survey of Consumer Finances, both average income and average wealth in the United States fell during the 2007-10 period: real before-tax median income by 7.7 percent (to $45,800 in 2010 from $49,600 in 2007) and real net worth by 38.8 percent (to $77,300 in 2010, compared with $126,400 in 2007). The most recent declines put real median family income 6.3 percent below what is was in 2001 and real median net worth 15.5 percent what is was in 2001. Median net worth fell for all percentile groups of the distribution of net worth but the largest decreases in proportional terms were experienced by the groups below the 75th percentile of the net worth distribution. From 2007 to 2010, the median for the lowest quartile of net worth fell from $1,300 to zero—a 100 percent decline; at the same time, the mean for the group fell from negative $2,300 to negative $12,800. For the second and third quartiles, the median and mean declines in net worth were smaller but still sizable; for example, median net worth for the second quartile fell 43.3 percent. 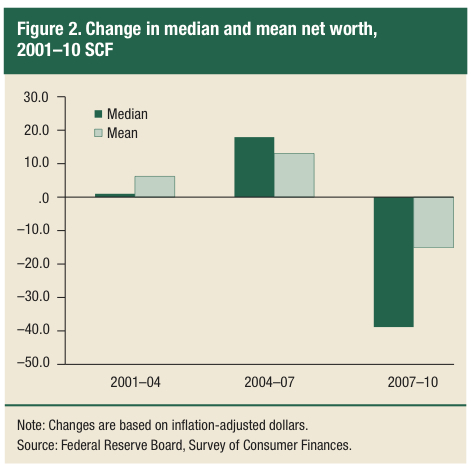 Median and mean net worth fell, but not nearly by as much, for the higher net worth groups. Families with incomes in the middle 60 percent of the population lost a much larger share of their wealth over the 2007-10 period than the wealthiest families. That’s because the bulk of their net worth is in nonfinancial assets (such as vehicles and primary housing) whose prices have barely changed, while the richest households hold both nonfinancial (vehicles as well as primary and secondary residential properties and business equity) and financial assets (bonds, stocks, retirement accounts), which have recovered much of the value lost in the crisis. The overall value of families’ liabilities decreased between 2007 and 2010, but the rate of decline was less than the corresponding rate for families’ assets. Thus, the ratio of the sum of the debt of all families to the sum of their assets—the leverage ratio—rose from 14.8 percent in 2007 to 16.4 percent in 2010. Once again, however, the disparity between those at the top and everyone else is stark: while the leverage ratio for the middle quintile rose from 24.3 percent to 26.5 percent between 2007 and 2010, it was still only 9.8 percent (up from 8.3 percent) for the top decile in 2010. Finally, the debt burden increased substantially during the 2007-10 period: the fraction of debtors with any payment 60 days or more past due climbed from 7.1 percent in 2007 to 10.8 percent in 2010. But again, the overall number hides important discrepancies: for example, only 2.1 percent of families in the top decile had debts 2 months or past due while 21.2 percent of those in the bottom quintile were substantially behind in their payments. As another sign that we’re in the midst of the Second Great Depression, both the average American household and those at the bottom—in terms of income, wealth, and difficulty in paying off their debts—are headed down the up staircase.